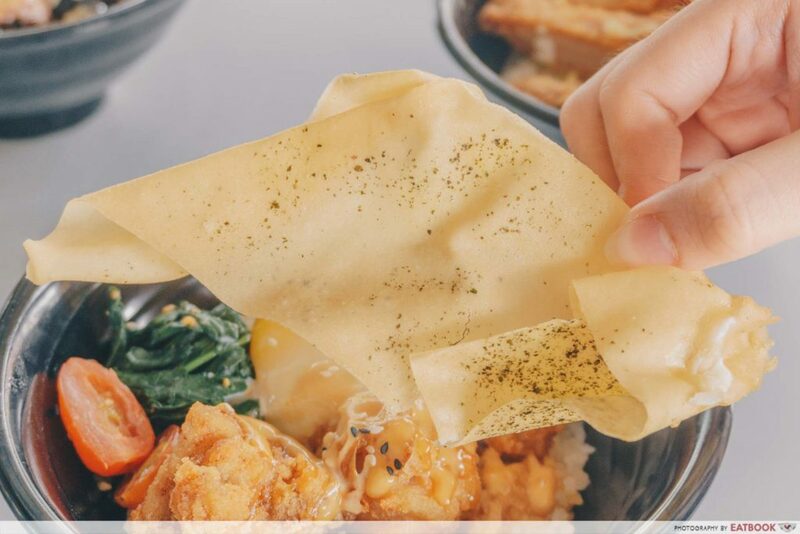 Opened just August this year, Bowl Chap is a humble hawker stall at Ayer Rajah Food Centre that serves affordable Japanese donburis with a local twist. 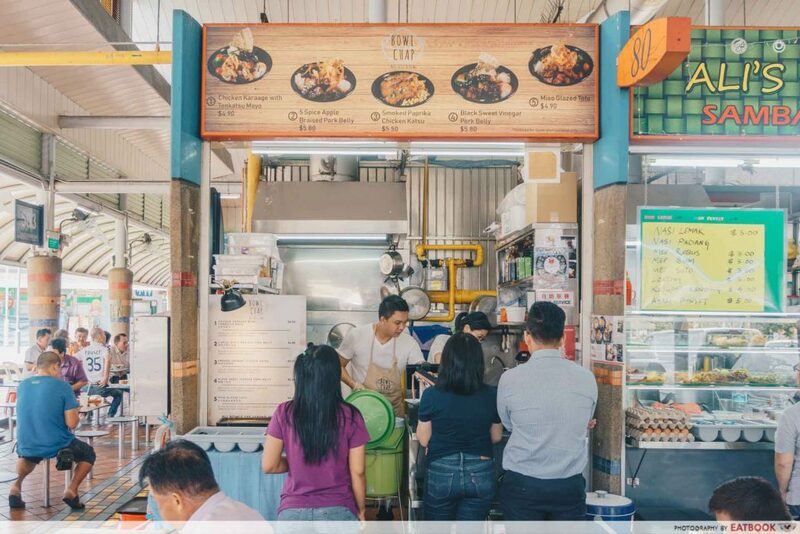 The stall is managed by a young couple – Lee Jin Rong and Lee Pei Sin. 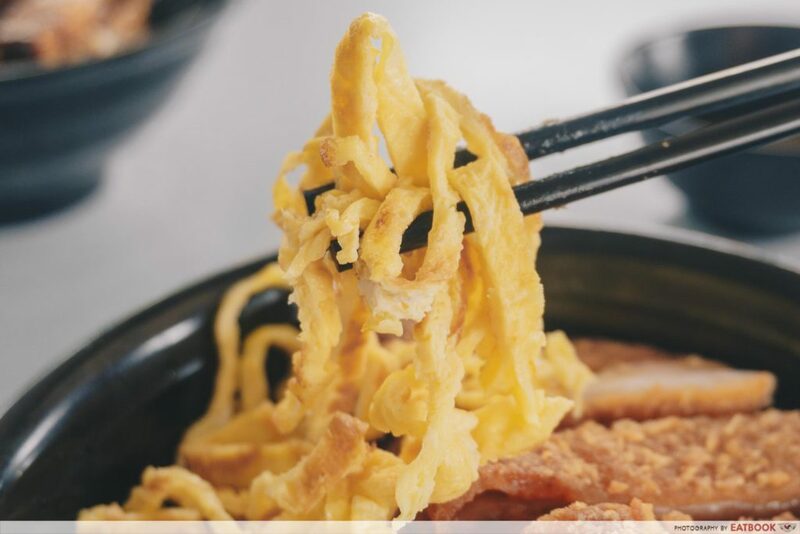 A naval diver for seven years prior, Jin Rong decided to pursue his love for food and went on to study culinary at Sunrice GlobalChef Academy. Thereafter, he scored an internship at the Tippling Club, where he honed his culinary skills there. Following his dream to open up his own eatery, Bowl Chap was born. 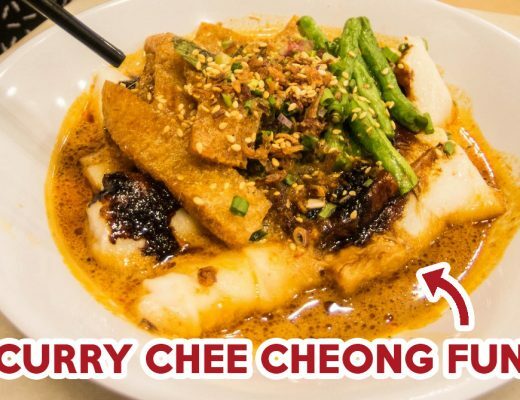 The 5 Spice Apple Braised Pork Belly ($5.80) is a popular order here. 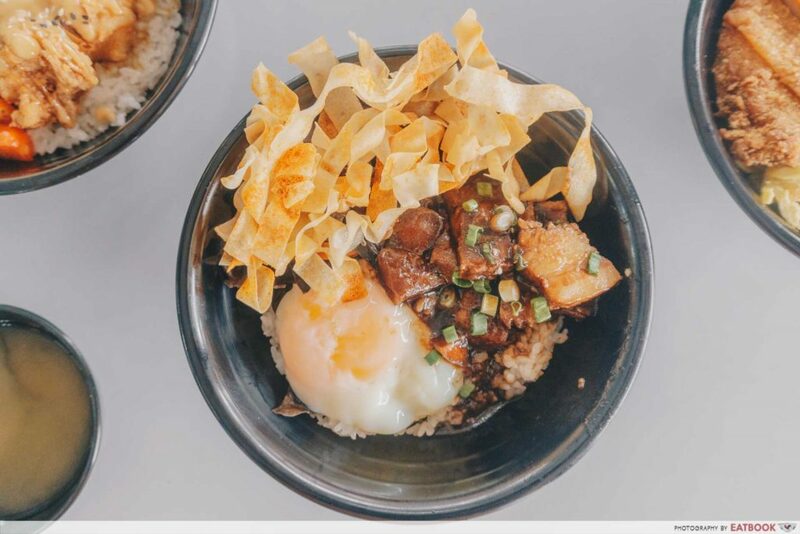 The dish comes with pork belly, an onsen egg, black fungus, carrots, and fried popiah skin crisps on a bed of warm Japanese rice. 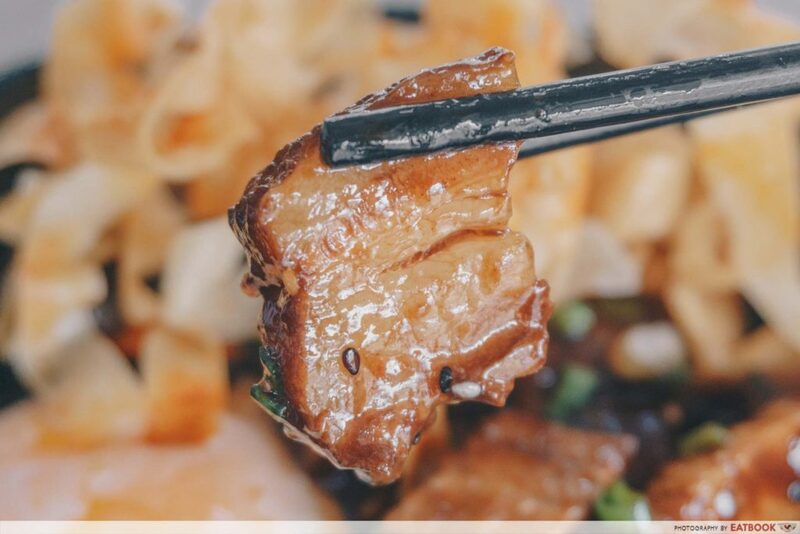 Generously glazed with a soy-based sauce, the glistening cuts of pork belly was visually appetising. The braised meat was plump and juicy, with a good fat-to-meat ratio that gave a burst of flavour on my tongue. The thoroughly marinated pork belly was perfumed with the sweetness of apple and well-balanced with spices. I also liked that sesame seeds were scattered over the top, adding a roasty, nutty fragrance to the meat. The flavours in this dish reminded me very much of the Chinese-style apple and pork ribs soup my grandmother used to cook. 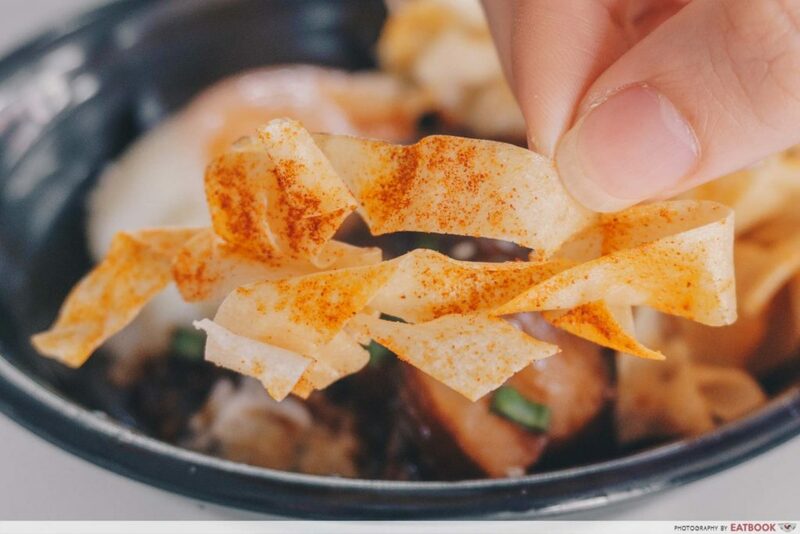 I could not guess what these crisps were and found out from the owners that they were fried popiah skin strips. On its own, they were bland, except for the slight heat from the spiced paprika sprinkled over it. That being said, the fried skins did provide a nice crunch to the dish and helped soak up the intense flavours of the sauce well. 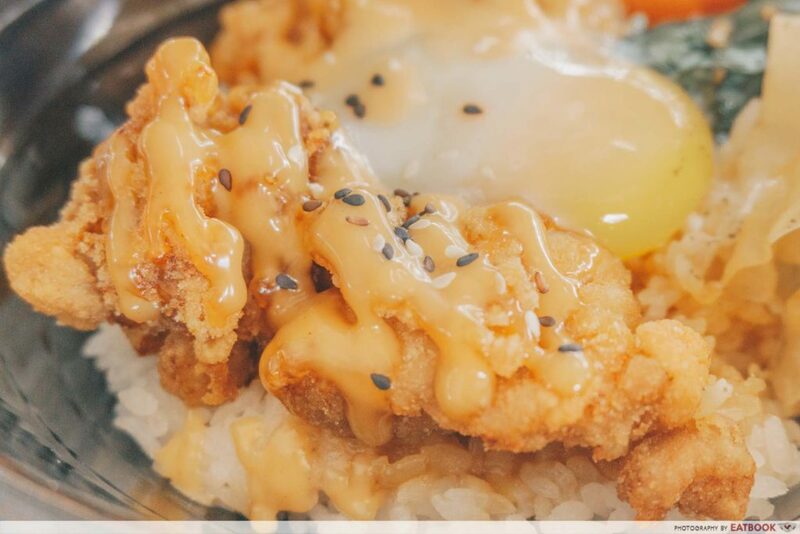 The jiggly onsen egg was perfectly cooked, and the oozy bright yellow yolk added a creamy richness to the rice. 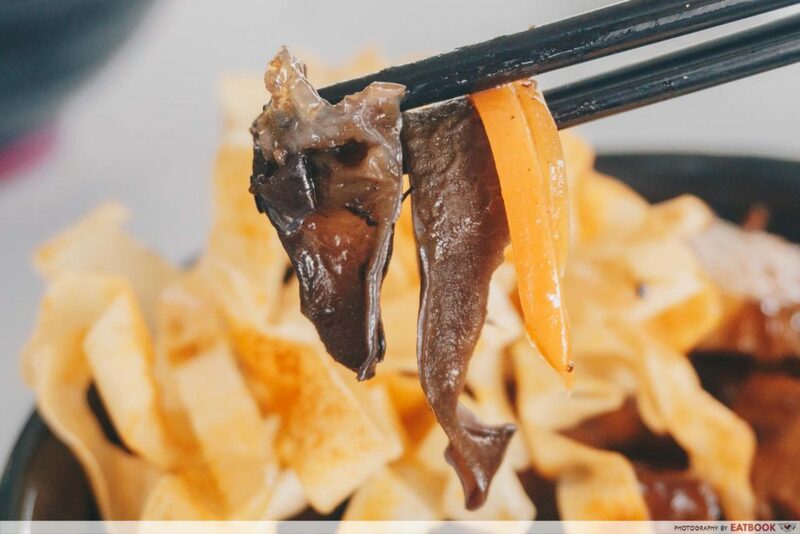 Hidden beneath the fried popiah skin was a mix of black fungus and carrots. The vegetables helped cut back on the greasiness and added a different texture to the dish. It was seasoned well, with a slight pepperiness that I enjoyed. 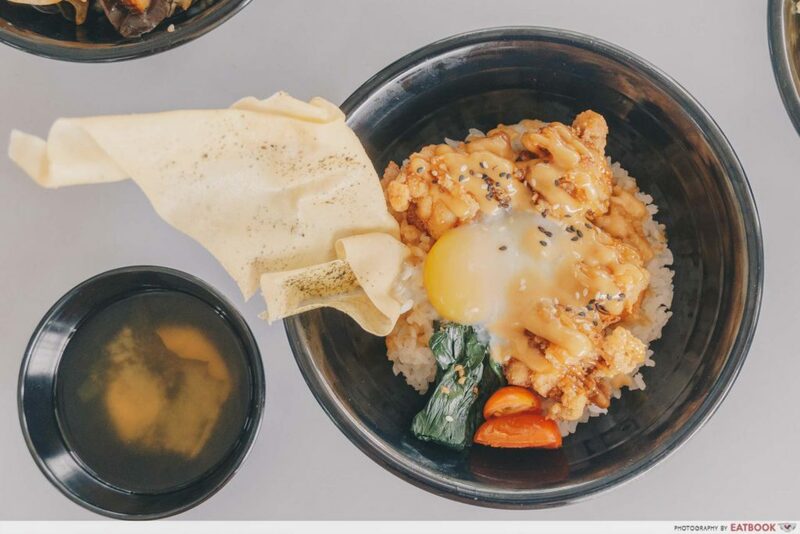 Each donburi is served with a bed of premium Koshihikari rice from Japan, where the individual rice grains are larger than normal. The rice was well cooked and retained a good bite with each mouthful. Served with crispy chicken chunks, fried popiah skin, an onsen egg, and a side of greens and tomato on a bed of rice, the Chicken Karaage with Tonkatsu Mayo ($4.90) was my personal favourite at Bowl Chap. 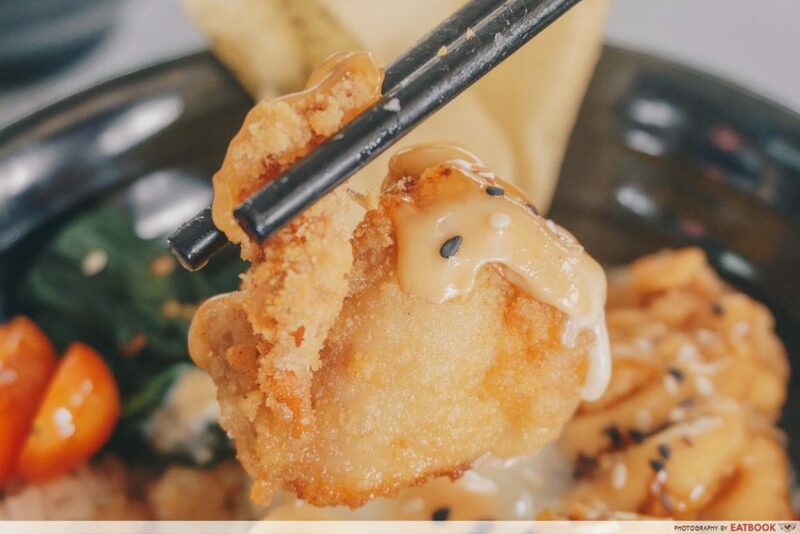 The fried chicken was drizzled with tonkotsu mayo sauce and topped with roasted sesame seeds. The chicken chunks were fried to a nice golden brown, and there were about four to five pieces of chicken in each bowl. The individual pieces were large and reminded me of my favourite popcorn chicken snack, except upsized. The tonkotsu mayo sauce was mild, but lent a strong umami to the dish. 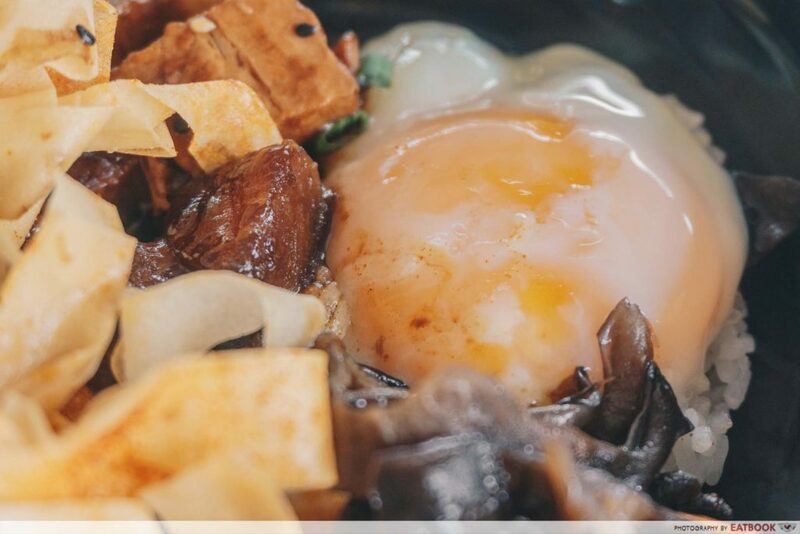 I had the second chance to break into the runny onsen egg – definitely #EggPorn at its finest. Watching the bright yellow yolk flow over the rice was oddly satisfying. 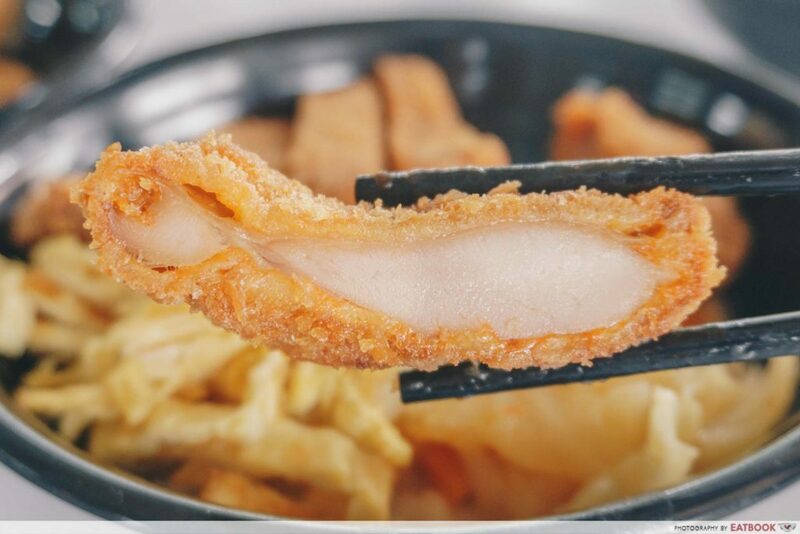 When the dish was served, my attention immediately went to the gigantic piece of fried popiah skin that crowned the dish. Unlike the one found in the pork belly donburi, this piece was not cut into strips. The skin was light and crispy, and was topped with seaweed salt, giving it a pleasant earthy saltiness. I wish they were more consistent with their seasoning, as some parts were more heavily seasoned than others. As someone who loves a little heat in my food, I was eyeing the Smoked Paprika Chicken Katsu ($5.50). 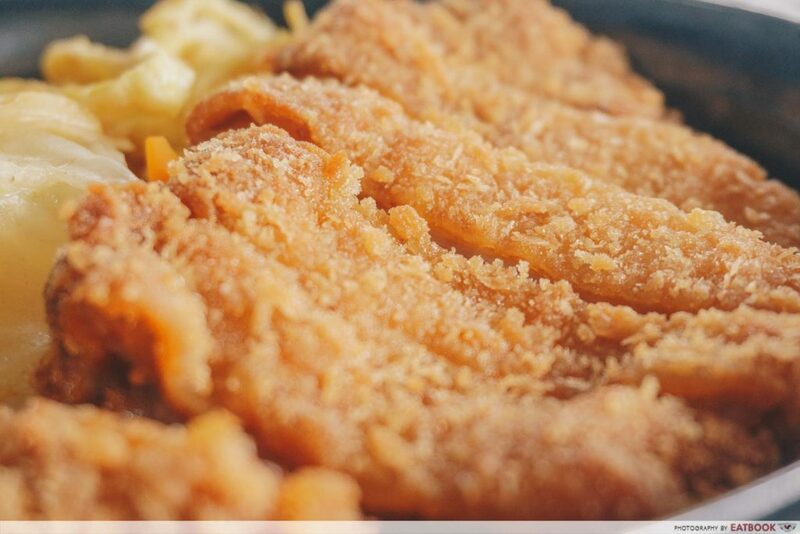 The simple dish featured crispy chicken cutlet with omelette strips and curry vegetables. Lightly battered and golden brown, the chicken cutlet had a crusty exterior that did not look too greasy. The cutlets are made à la minute, so you can expect fresh, hot cutlets each time. Picking up a slice of the chicken cutlet, I was pleasantly surprised that the meat was not pounded too thin, and still had a good thickness to it. The crispy batter added a good crunch to every bite, and was nicely seasoned. Unfortunately, I found the meat encased within to be a little dry. The serving of omelette strips was generous but forgettable, and could have had more flavour. 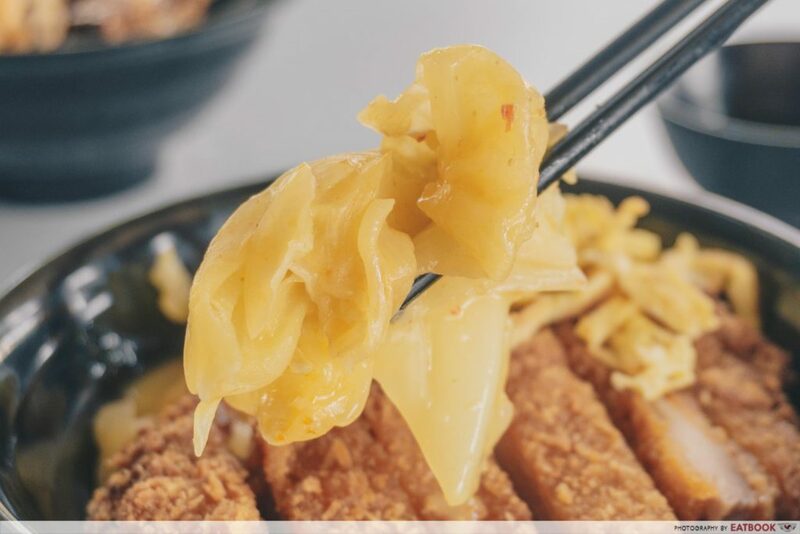 I was expecting a crunch from the chap chye, but it was soft enough for me to break it apart without much strength in my bite. It was light, and reminded me of vegetables in sayur lodeh. I liked that all the ingredients for each donburi are not the same; each tweaked to complement the main component best. 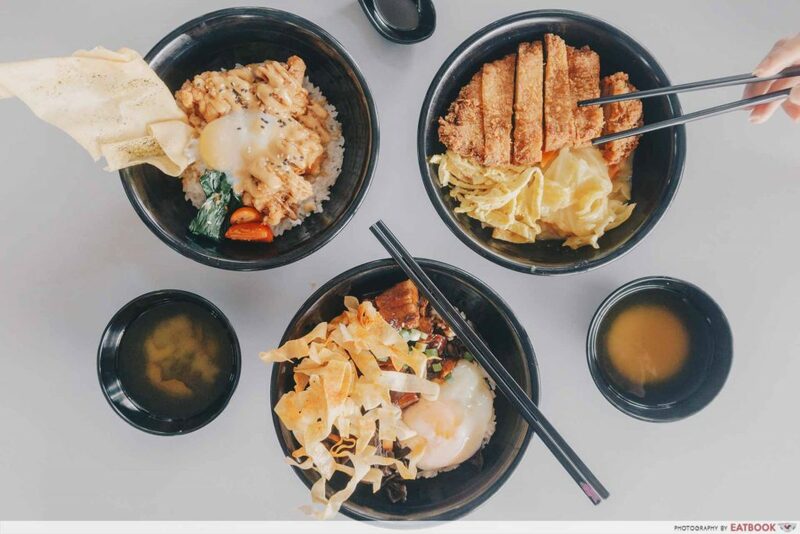 With every order of donburi, you can help yourself to a complimentary bowl of seaweed miso soup from the self-service kiosk in front of the stall. The soup was light and not too salty, and went especially well with the slightly sticky Japanese rice. 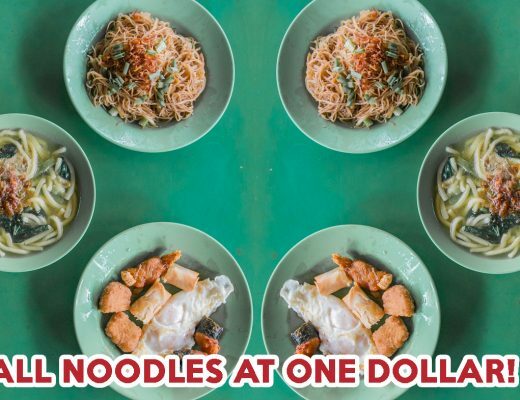 Bowl Chap is a humble hawker stall located at Stall 80 in the corner of Ayer Rajah Food Centre. The closest MRT station is 30 minutes away, so getting here may be rather inconvenient if you don’t live around the area. The area is clean and bright, with plenty of seats to go around. Despite the lack of fans, there was a good amount of ventilation and I was not feeling sticky after my meal. 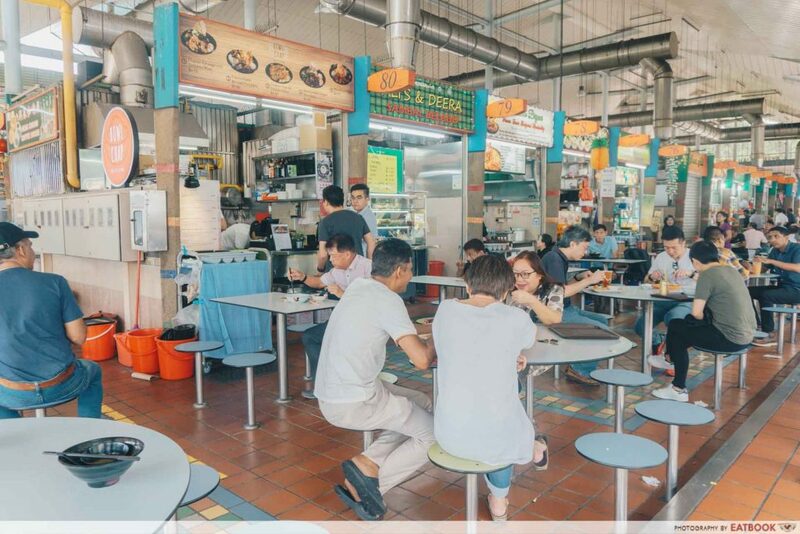 It heartens me to see more and more millenials venturing into the hawker scene. 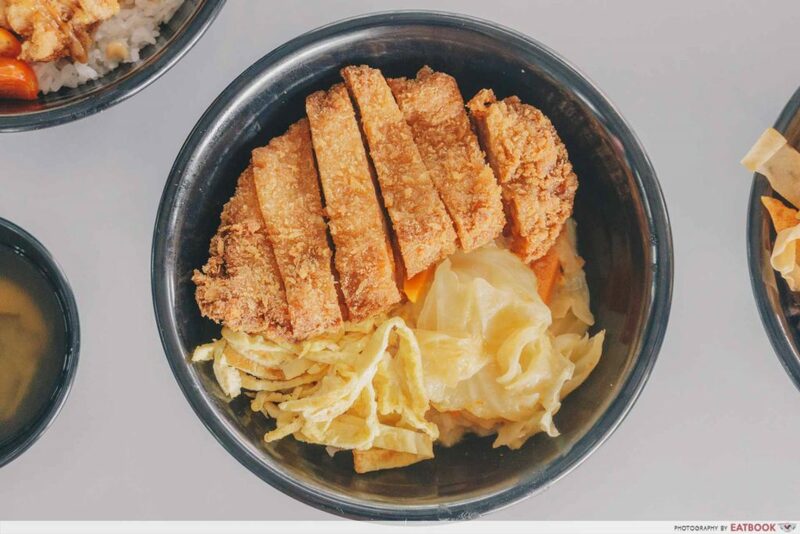 Overall, Bowl Chap stands out from other donburi eateries for its affordability and sizeable portions. 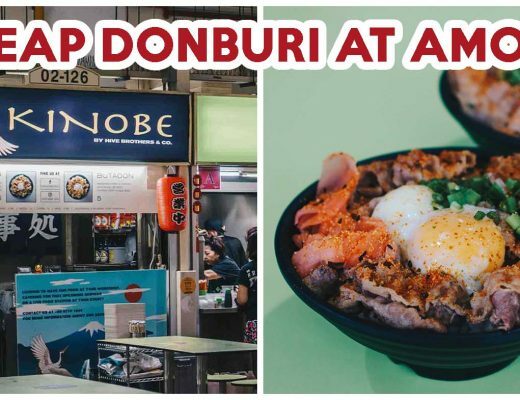 While food here may not be the best I’ve ever tasted, it definitely a good place to get your donburi fix without breaking the bank. 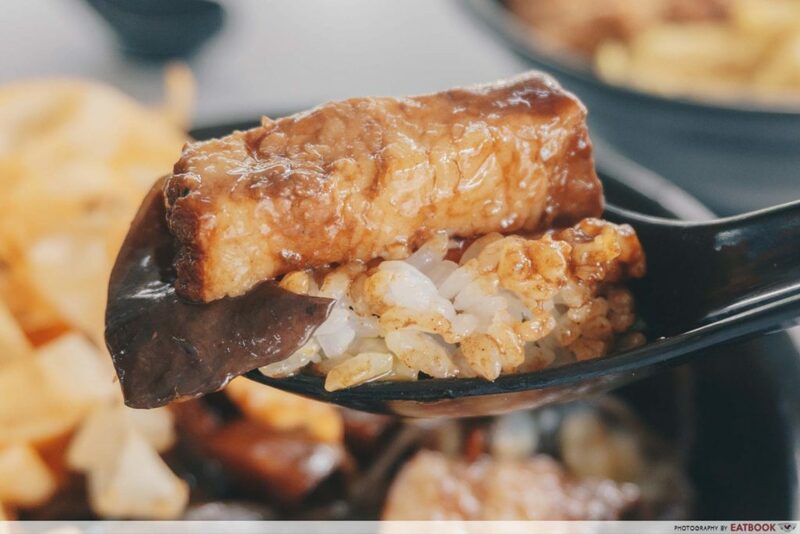 Bowl Chap is looking to expand their menu by adding weekly specials and a fish option to cater to those who prefer seafood over meat. 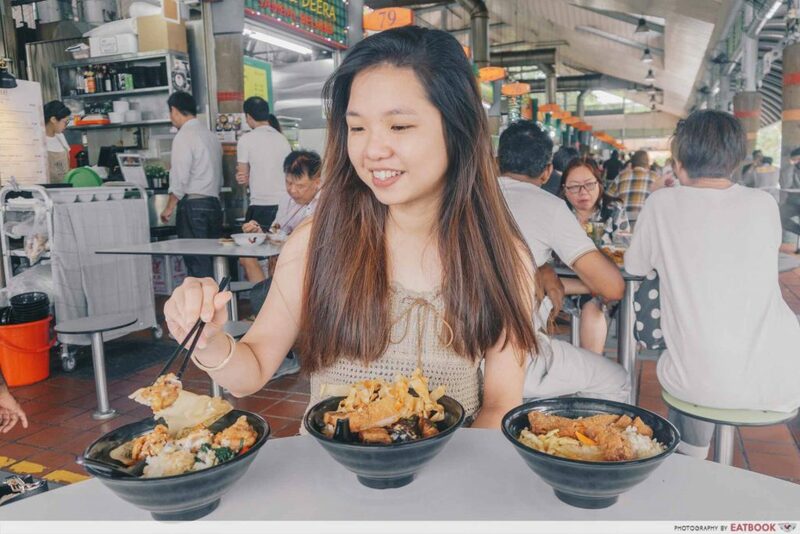 Jin Rong also has bigger ambitions to open a chain of shops at various MRT stations, catering to the working crowd looking for a bite on the way home, so keep an eye out! Bowl Chap is not halal-certified. To travel the world with a notebook and pen − and my hunger.